We recently bought a new king sized mattress set, but haven't found a bed frame or headboard that we like to go with it... I wasn't digging the giant blank space above the bed, so I thought I'd whip up a little something to fill the space while we continue the hunt. I've had this piece of plywood sitting around for several years, and I decided that this would be a good use for it. I love the subway and chalkboard art that I'm seeing everywhere right now, so I thought I'd do something in a similar style, using one of my favorite Scriptures from I Corinthians 13:4-8. 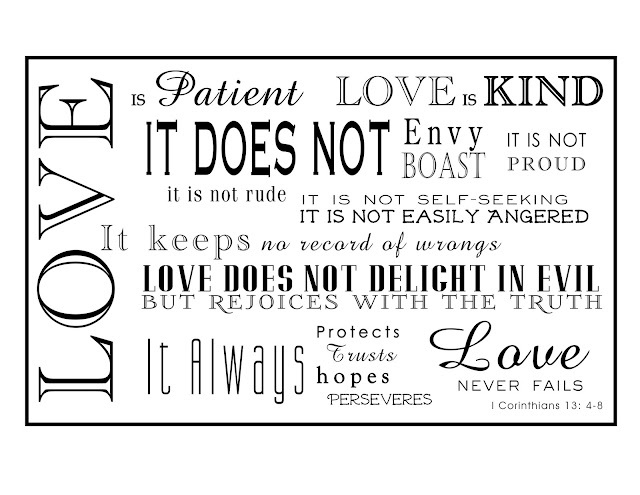 We had this read at our wedding so it's special in that way, plus it's just a good reminder to have hanging in our home. I had a lot of positive feedback when I posted this on my Facebook page, so I thought I'd do a little post on how I made it, and include the graphic so that you can make one too, if you'd like. My piece of plywood was 30"x48," and after sanding the edges and front and back, I coated the whole thing with a layer of white acrylic gesso. I used several different colors of acrylic craft paint, ranging from a light celery green to an aqua blue and burnt umber. I squirted small puddles of each color onto a paper plate, then added a puddle of acrylic blending medium in the middle. Using a large, regular paintbrush (like you'd use for painting trim in your house), I dipped the bristles into a few of the colors at a time, including a little of the medium, and then brushed it onto the plywood. I kept the brush fairly dry, and added different colors in a streaky pattern (don't just blend all the colors together - if you dab one end of the brush into one color, the other end into a different color, then tap it into the medium, that should make it turn out like this. You want a streaky, weathered look that makes it seem like it's had several layers of different colors of paint, and they've worn off in places. After my base coat had dried, I used an art projector to transfer the lettering onto the board. When you project it, you need to make sure that the lines are straight, and that the projector and board are perfectly facing each other, without being at an angle (or it will distort the lettering/lines). I penciled the letters in first, then used a small flat brush and a small round brush to go over the letters in an antique white. This part can be a little intimidating, but trust me, mine doesn't look perfect up close. If you don't have access to a projector, another option would be to have a printing place (like Staples or Kinkos) do one of those giant prints for you (like they do for blueprints), then you could use graphite paper to transfer it to the board by tracing it. Once my letters were dry, I mixed a small amount of burnt umber into the acrylic medium, and did a glaze over the whole thing to give it a uniform, "antiqued" look that toned down the contrast between the background and the lettering. I let that dry, then added some hooks and wire to the back for hanging! I also used some sandpaper to knock a little paint off the corners and increase the "weathered old sign" look. I'm sorry I didn't take pictures of each step so you can see what I'm talking about - this was kind of a spur of the moment project - but feel free to send me any questions you may have. I'd love to see pictures of your finished project if you make one yourself! Here's a copy of the graphic I made in Photoshop - feel free to copy for your own personal use.